A divisive election campaign is almost over and 28 days of trading insults will soon end. Yet, amid the unceasing attacks, there have been some intriguing economic and business policies pitched by the parties. Today, let’s set aside the personal and focus instead on the policy. Here’s a few ideas that surfaced on the campaign trail that are worth discussing. • The plan by the United Conservative Party to encourage apprenticeships and vocational schools is smart policy. The party would quadruple the number of paid apprenticeships to 6,000 by 2023 under a non-profit program that links up employers and students. The strategy would create a new scholarship for high school students who’ve shown abilities in the skilled trades, and it would expand a program to assist women who want to find work in such careers. The price tag is modest, topping out at $12 million a year. The UCP notes the provincial Labour Department expects more than 3,000 skilled workers will be retiring each year until 2025. The aging of Alberta’s workforce will create opportunities for more welders, electricians, heavy equipment technicians and other skilled positions. University of Alberta labour economist Joseph Marchand pointed out similar approaches have been pursued in Germany with success. “Those who have the trade skills, these are the workers who are demanded when things are going full steam in Alberta and other places in Western Canada,” said Marchand. 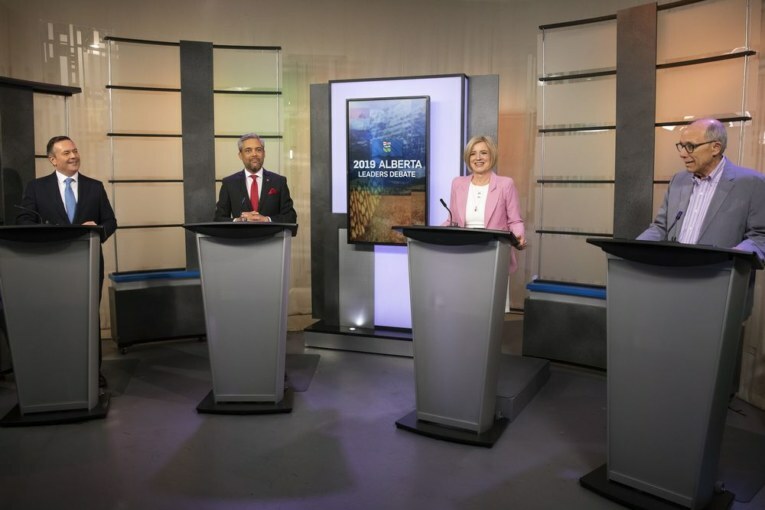 • The Alberta Party has pitched the creation of an Alberta-to-Alaska rail corridor as part of a transportation passageway to get products moving out of the province. As envisioned, a private-sector rail line would link up Fort McMurray with the Trans-Alaska Pipeline system, eventually taking oil to the port of Valdez where it could be exported. If built, the project would bypass the pinch points in Canada. While $10 million would be used to bring the consortium together, the private sector would ultimately be responsible for the construction costs. Finding a way to create a designated area for railways, power lines or pipelines would help industry get around the not-in-my-backyard mentality that frequently blocks infrastructure in Canada. “It provides certainty for proponents who are looking at anything from pipelines to electricity corridors,” said Ken Kobly, president of the Alberta Chambers of Commerce, which backs the concept of a utility corridor. • While the idea has become a political target, the NDP’s oil-by-rail proposal has merit. Alberta doesn’t have enough transportation capacity to move all of its oil out of the province. Every proposed pipeline faces potential uncertainty, such as the recent delay to Enbridge’s Line 3 project. The NDP’s plan to spend $3.7 billion to lease rail cars would boost transportation capacity out of Alberta by 120,000 barrels of oil per day. It projects the deal would make back $5.9 billion in higher royalties, taxes and revenues, netting the province $2.2 billion. It’s expensive and we’re relying on the province’s forecasts that the initiative will make financial sense. But the cost of not having enough transportation capacity is known. The industry, province and country were losing up to $80 million a day last fall when the price discount on Western Canadian Select oil skyrocketed because of a lack of pipeline capacity. The counter argument is producers will tackle a lack of oil-by-rail capacity on their own, yet that didn’t happen last year. If we don’t see private-sector players respond quickly enough, the province likely won’t be able to end production curtailment this year — or it risks another escalation in the Canadian crude price discount. “It really is an insurance policy,” said former Canadian Association of Petroleum Producers vice-president Greg Stringham, who studied the crude-by-rail situation last year for the province. • The Liberal Party floated one of the gutsiest and most politically radioactive ideas of the campaign: introduce a sales tax. Alberta has run deficits in 10 of the past 11 years, clear evidence the province has a significant structural deficit. Relying on oil prices to climb much higher is a gamble. Curbing spending enough to match government revenues will be difficult over the long haul. The Liberals recommend Alberta implement a harmonized sales tax of eight per cent at the tills. The party says this strategy would lead to no income taxes for two-thirds of Albertans, and it would raise up to $1 billion in additional revenue from tourists. I don’t love the idea of a PST. But it’s time for an adult conversation about how we balance the books in both the short and long term. “I’m glad someone at least raised it,” said Ron Kneebone, an economist at the University of Calgary’s School of Public Policy. So there they are, four ideas worth talking about. Some voters will like them, others won’t. But for those weary of a toxic political battle, there’s not a single personal attack in the mix.